As an integral component of The Central Valley project, the Folsom Dam was built in 1955 by the U.S. Corps of Army Engineers roughly twenty-three miles northeast of the City of Sacramento. It is currently operated by the U.S. Bureau of Reclamation. Located right below Folsom Dam is the Folsom Power Plant, which produces approximately 198,207 kilowatts of electricity (equivalent to 10% of the power consumed by the City of Sacramento) through the use of three turbines. These turbines generate electricity by harnessing controlled gravitational releases of water from Lake Natoma. These releases eventually run into the American River which flows to the Sacramento River, and is subsequently expelled into the San Francisco Bay. Thursday, February 22nd 2007 marked the ground breaking ceremony for construction of the Folsom Bridge Project. After the September 11th attacks on the World Trade Center buildings, a comprehensive review of sites that had potential to be terrorist targets was conducted by U.S. Bureau of Reclamation. Due to the proximity and population density surrounding the Folsom Dam, it was determined that continued public access to the Folsom Bridge Road posed too great a risk. As a vital artery for transportation across the city of Folsom, its closure would put undo stress on the remainder of the city’s thoroughfares, thus an alternative route had to be constructed. 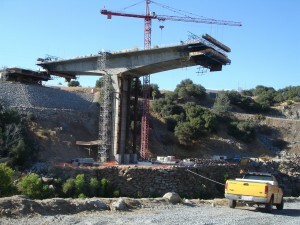 The Folsom Bridge construction site is a joint venture between U.S. Army Corps of Engineers, U.S. Bureau of Reclamation and the City of Folsom. The site itself occupies 380 acres, 80 acres were to be disturbed to construct the Roadway and Bridge. The New Folsom Bridge was to be constructed over the pristine American River that runs crystal clean most of the year. During the first wet season significant changes were required to the initial design of the Storm Water Pollution Prevention Plan including shed-on calculations, site topography and soil characteristics. Several slope failures, inadequate basin sizing and two notices of violation from the Regional Water Quality Control Board expedited the reevaluation of the SWPPP. After these failures were identified, the City of Folsom hired Beth Smiley of Thunder Mountain Enterprises as an outside consultant for the purposes of assisting in SWPPP design update, site monitoring and help keep the site out of trouble with the State. Thunder Mountain Enterprises worked in collaboration with City of Folsom, US Army Corps of Engineers and the prime contractor to address SWPPP design deficiencies. The sheds were evaluated and diversions and pumping was implemented. The slope stabilization for temporary erosion control was redesigned. The contractor and original SWPPP design consultant assumed the permenant erosion control would be sufficient for the slopes and soil type. Some critical areas were redesigned with Profile Products Green Armor System. It was soon discovered that the premise behind the original Storm Water Pollution Prevention Plan was contingent upon the assumption that the decomposed granite, a major constituent of the soil on-site, would allow rapid infiltration of storm water. When storm water did not infiltrate due to steep topography, abundance of rock granite formations below the surface and significant shed-on the rainfall that occurred on the site created massive amounts of watershed .by increasing erosive forces on unstabilized soil. As the on-site hydrology failed to infiltrate and began to move, the topography of the project became an important factor to consider. Cuts made through the hills adjacent to the Folsom Dam to facilitate road access to the Folsom Bridge, resulted in very steep (1:1, 2:1) slopes with very long runs (some in excess of 50 linear feet). In most cases these very long running, steep slopes served to amplify erosion by increasing the sheer strength of storm water on already highly erodible soils. To further complicate matters, the calculation of actual acreage that would shed storm water on to the project site was grossly underestimated. All of these factors combined contributed to numerous instances of erosion, slope failure, pooling and turbid water discharge. After the aforementioned problems were identified, Thunder Mountain began putting together a plan to address each of these particular concerns. Beth Smiley was responsible for completely redesigning the existing slope protection in an effort to re-stabilize areas that had already failed, and ensure continued stability for the duration of the project. This goal was achieved with the use of Profile Products’ Green Armor System for permanent slope stabilization around critical locations, and their general Erosion Control system for temporary erosion control. The use of both temporary and permanent erosion control systems was necessary to satisfy multiple challenges that the Folsom Bridge Project involved. Profile Products’ Green Armor System was developed as an alternative to what is known as “Hard Armor,” which mainly involves the use of stone or rock in storm water management. Advantages to using the Green Armor System over a hard armor design abound.